Pesto comes in many forms... from the classic basil genovese to a variety of spreads that highlight different herbs, greens, nuts, and/or cheeses. While some traditionalists may have trouble calling these varying spreads pestos, I take "the more the merrier" approach. There are just so many wonderful combinations that can be made. Though many highlight a particular herb (parsley, cilantro, basil, etc) or a combination of two or more herbs, the pesto pasta featured here takes in an entire salad! The idea for this particular pasta was piqued by thoughts of a favored salad I make from Ina Garten's 2006 cookbook, The Barefoot Contessa At Home. Her recipe is a super simple spinach salad that gets turned a bit with some prepared pesto, defrosted frozen peas, shaved parmesan cheese, and a sprinkle of toasted pine nuts. It's insane how simple and delicious it is. 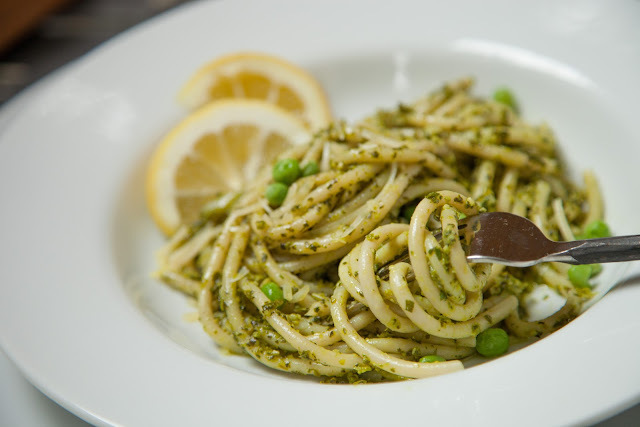 So, why not convert that Pesto Pea Salad to a main pasta dish? The "pesto" part of this pasta comes together super quick with the help of a food processor. A good heap of fresh spinach gets a spin to break down a bit and make room for the addition of defrosted frozen peas, fresh parsley and basil, toasted pine nuts, some freshly squeezed lemon juice, kosher salt, and a good drizzle of extra virgin olive oil. The addition of fresh lemon really helps brighten and enliven the flavor of this spinach-laden "pesto" and a generous sprinkle of parmesan cheese and a few fresh (or defrosted frozen) peas lend a pretty (and tasty) garnish. The end result is a quick and delicious, super-good-for-you pesto that beautifully laces the more robust threads of al dente bucatini pasta. Inspired by the Pesto Pea Salad from The Barefoot Contessa At Home. The "pesto" in this pasta uses an entire 5-ounce container of baby spinach. While you can easily add parmesan cheese to the pesto making, leaving it as a garnish makes it a friendly serving for dairy-free eaters. A bit of reserved pasta water pulls the pesto and pasta together. Note that you can easily swap in 1/2 cup of dry white wine for a 1/2 cup of reserved pasta water, if you'd like. And... it's best with lots of fresh lemon served alongside to squeeze over top! Cook pasta in a pot of boiling, salted water (according to package directions), until al dente. Reserve and set aside 2 cups of cooking liquid. Drain pasta and set aside. Meanwhile prep pesto by adding spinach to bowl of food processor, equipped with blade. (You may have to add in steps in order to not crowd bowl.) Pulse spinach until it resembles a fine chop. Add basil, parsley, pine nuts, 1 cup defrosted peas, and salt. Pulse until well incorporated with spinach. Through opening in top cover of processor, drizzle fresh lemon juice and 1/2 cup olive oil; pulse until fully incorporated and smooth. Set aside. Heat 1 tablespoon olive oil in large, deep-sided skillet over medium heat. Add shallots and garlic to skillet and sauté until shallots are translucent (reduce heat, if necessary, so as not to brown shallots), about 2 to 4 minutes. Add prepared spinach-pea pesto to skillet, along with 2 cups of reserved pasta cooking liquid. Stir to combine and heat through. Add cooked bucatini to pesto. Using tongs, turn pasta in pesto to fully coat. Season with additional salt to taste. Plate pasta, top with a sprinkle of parmesan cheese (if preferred), a few turns of freshly ground black pepper, a few whole peas (either defrosted or fresh), and several wedges of fresh lemon to squeeze over top.